Register for summer March 4, 2019! Want to catch up, get ahead, or stay on course for graduation? No problem! Stay with us this summer and make it happen. Finish three credits in as little as four weeks! With our 15% undergraduate summer tuition reduction* and reasonable summer housing rates, we can help you to keep moving forward! View the 2019 summer course schedule online. Summer 2019 undergraduate tuition has been reduced 15% to $952 per credit. A typical Monmouth class is 3 credits; most labs are 4 credits. A lab fee will be applicable for some courses. To download the summer financial aid application and learn everything you need to know about possible aid, please visit the Guide to Summer Financial Aid. Monmouth boasts some of the most reasonable rates for summer housing along the shore! Learn more about summer housing or submit the online housing application. You can also contact the Office of Residential Life at 732-571-3465. Monmouth boasts some of the most reasonable rates for summer housing along the shore! Parking is available for students attending summer courses. There is no fee or decal required. Interested in the sciences? Then Monmouth’s intensive 12-week Summer Research Program might be for you! Spend four weeks in Italy this summer or six weeks in Spain… all while earning credit! Learn all about study abroad opportunities. 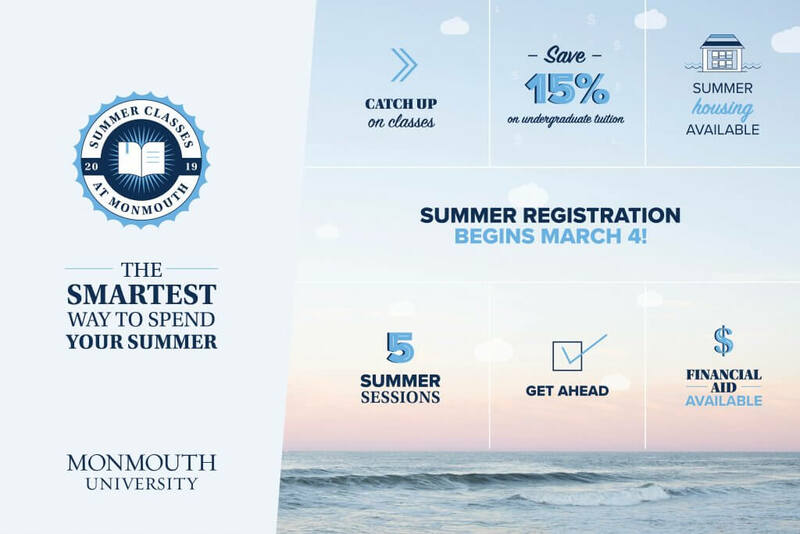 If you have any questions about Summer Sessions at Monmouth University, please contact the Office of Undergraduate Admission at 800-543-9671 or 732-571-3456. Please note: The Family Educational Rights and Privacy Act (FERPA) is federal legislation passed in 1974 which established guidelines governing the way educational institutions maintain and supervise student records. Learn more about how FERPA applies to Monmouth students. Summer undergraduate tuition reduced 15%!